Newspapers are on tighter deadlines these days. Some daily newspapers don't start running the presses until midnight. In journalism slang, it's called putting the paper to bed. 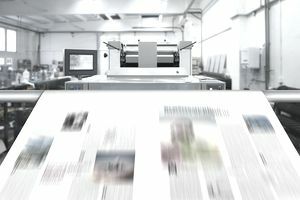 Today, with more newspapers getting printed at the same plants, bedtime is getting earlier and earlier. Instead of midnight, it's not unusual for some newspapers to get printed at 6 p.m. This has affected weekly newspapers, too, because even independent weeklies often contract with daily papers to use their printer. This can happen if the weekly hasn't already been bought by a chain. There are thousands of newspapers, and they all do things differently. But this is a rough guide. There's usually a meeting in the morning to talk about who's writing what stories and how much space ("news hole") reporters and editors need to fill. The news hole is what's left after the advertising department delivers dummy pages with the ads placed on each page. You might hear a journalist talk about a "budget meeting." They don't mean money. They mean this meeting about the new budget. This meeting is when reporters typically pitch stories to their editors. These are usually longer-term stories: features, investigative reporting, things that take time. You don't pitch breaking news. If there's a fire or a murder trial, the editor assigns that. While reporters get busy dialing up their sources or hopping in their cars to cover events, the editors start filling up the newshole. The editorial page and feature sections aren't as subject to deadline pressure as much as the hard news folks. They can get done earlier. At smaller dailies and weeklies, the editorials and feature pages might get finished days in advance, with the editor swapping in some late-breaking material if need be. For example, the Sunday paper is the fattest edition at any newspaper. It's a monster. But all those stories don't get written on Saturday. They get assigned on Tuesday or pitched on Thursday, and everything but breaking news is probably laid out and ready to print by Friday night. That's why you can usually buy an early version of the Sunday paper on Saturdays. The front page gets done last. At newspapers where a paper still gets printed at midnight, the deadlines are tight, but you technically have about 16 hours to gather news and put out a paper before you put it to bed. If you're dealing with a paper that's going to bed at 6 p.m. instead of midnight, they've got about an eight-hour workday to do the same amount of labor. Deadlines are much tighter. You've also got to factor in quality control. Copy editors need to edit stories before they run. A different set of editors design and layout each page. Then, editors need to proof-read each page before they're good to print. All this takes time. A simple way to look at newspapers is to treat them like you'd want to be treated. The later in the day, the harder their deadlines are crushing down on them. Try to call or e-mail them in the morning whenever you can. A common mistake is to spend all day crafting a press release or op-ed, then sending it at the close of business, right when reporters and editors are rushing to beat their deadline. If you're dealing with a weekly newspaper, ask about their deadline day and try to talk to them on different days. Ask them about their schedule. They'll appreciate it.